Gina has been discontinued but is still one of my favorite dolls. Don’t you love that groovy belt! If you’ve seen the Springfield Collection Doll named Maria (or Sofia), then you’ve seen the doll that Gina turned into. Actually, when Gina was first introduced her hair was styled just like Maria’s is styled now. She had no bangs, and her body had stuffed upper-arms and upper-legs. She was from the 2nd Generation of Springfield Collection dolls, the ones that were pre-stuffed, but still had the old-style bodies. Only the lower arms and lower legs were plastic, the rest of their bodies were stuffed. When the 3rd Generation of Springfield Dolls was introduced Gina got bangs as well as full plastic arms and legs. This is the classic Gina, the Gina who’s my favorite. Although Gina has been discontinued, if you want a Gina of your very own Sunshine Crafts still has a few in stock. To me Gina is the closest that Springfield has ever come to an Asian doll. My BFF in real life is filipino and I am routinely frustrated that Springfield doesn’t offer a doll who looks like her. Lots of parents at my church have adopted baby girls from China. Right now they are buying Madame Alexander dolls from Walmart, which are least expensive Asian dolls currently available. One day I hope that Gina will be made again, with light skin and her silky black hair with bangs, so that all of the beautiful Asian girls who long for a Springfield Collection Doll who looks like them, will finally have one of their own. I don’t know if Springfield has much of an overseas market, but if they do, there must be a huge demand for a light skinned Gina. Also, I admit, that I want a Gina doll who looks like my BFF, who is named Rina (note the similarity–Gina & Rina). Then I can do Maggie & Rina doll fashion shows, and maybe add a Maria (or Julie) doll too, and do Maggie & Rina & Sharry doll fashion shows. Now wouldn’t that be something? While I go on dreaming, I’ll share Gina’s lost profile for the rest of you. Family: Older brother and Younger sister. Pets: 2 parrots named Papaya & Mango. Best Day: When she got her two parrots. Favorite Activities: Dancing hip hop, playing tennis, watching movies with her little sister Kelly, preparing Sunday breakfast with her Mom, training her parrots Papaya and Mango to say “hello”, “love you”, “gimme a kiss”, and “pretty bird”. Pet Peeves: Having her hair in a ponytail, and losing a tennis match against Amanda (but it’s ok because they are best friends). Her Dream: Being a professional hip hop dancer! Dressing Up: Mini denim skirt with heart top. Hanging Out: Denim Jeans with, tee and brown Mary Jane shoes. Compare this profile with Maria’s current profile. I couldn’t find any similarities. Could you? She is so pretty with bangs! What? Did I hear my name mentioned? And Julie’s too? LOL! I think this is a very pretty doll. I do have one, (renamed April), and she’ll make her debut in December along w/ Niya (renamed Wendy) and Abby (renamed Jennifer). I would like an Asian Springfield girl, only not w/ bangs. Three Springfield girls already have bangs, and my Julie’s hair is so much easier to style than their’s b/c she has more long hair instead of the bangs. If they came out w/ one I’d name her Jasmine. I even have a pic of her (from when the Springfield art dept. was playing around mixing the Maria doll and Emma together) hanging on my fridge. I wish they’d release one for real. Yeah, I mentioned you. When I play dolls I always think of my Maria doll as Julie, who has come to play. In my head, I don’t even refer to her as Maria, I think of her as Julie because of your videos about her. That’s one of the reasons I want to settle on a favorite doll and use her as my main model. I just can’t decide if i want the red haired one or the brown haired one. Maybe I’ll find one with really icky hair and shave her and buy her a wig. I just can’t make up my mind. 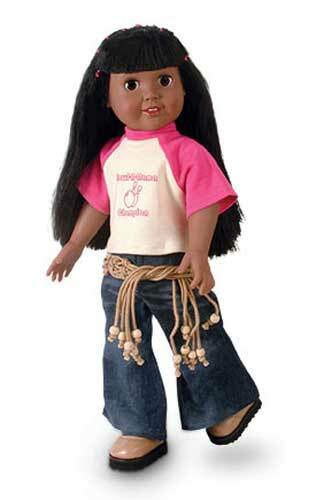 for that matter, I could put a black wig on a light skinned doll and make my own asian doll. I may end up doing that eventually because I really want an Asian Springfield Doll. I’m really looking forward to meeting April and Wendy and getting to know them better. I think they’ll have a lot of fun with Julie. Sharry is the lady to talk to about that. I’ve done it with my Crissy doll, but never with a Springfield doll. One thing I have done with Springfield Dolls is to Brush their hair. Wash their hair with dish soap. Then put people conditioner in their hair and leave it over night. Rinse out completely in the morning. Allow the hair to dry for another day and then survey the results. In my experience, this works okay. Not as good as Downy press, but it requires no iron and not too much adult supervision. This is the way I do barbie hair when I get Barbies from the Good Will. It makes the hair better, but not perfect. Be sure to wrap Abby in a plastic bag and duct tape if you get her hair wet. This keeps her body nice and dry.Whatever you decide to do , good luck and I’d love hear about the results. Hey, DollyGirl, check out my videos on YouTube about how to do a Downy Press, and general Springfield Collection hair care in general. If you lived near me, I’d do it myself. I can’t guarantee perfect results, but it will be a definite improvement. Lemme know how it turns out. And please only do a Downy press w/ ADULT SUPERVISION!! Hardygirl66, can you send me a link to your channel? Okay thanks I’m going to go watch your videos now, I love the Halloween one! I just got back from Micheals! I got the Springfield purple bow flats and I LOVE them!!! That belt really goes well with Gina’s outfit. Well, it’s the clothes and accessories that make dolls more beautiful and alluring, right? Where did you get the cool belt Gina is wearing? Was it part of your purchase before? 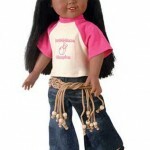 Well, my daughter found wonderful outfits and accessories for her dolls here: http://www.doll-clothes.com/. They offer almost everything a doll needs! I’m searching for a Gina doll right now to complete my collection. If anyone’s got any ideas where I could find one, please reply. Thanks! Which? The old generation with arms and legs half stuffed, half plastic?